Vacation and fine food. They go hand in hand. In the large, well-equipped galley the chef and his brigade strive to satisfy. Menus are varied, carefully executed and very healthy. Special diets are readily accommodated; there are plenty of kid-friendly dishes. The wine list is made up exclusively of Argentine and Chilean vintages and there's no corkage should you prefer to bring your own selections. Dining on the Salon Deck is one-seating at four tables, each with six-places—you can choose your companions. On the Spa Deck, the 14-seat bar is supplemented by 3 tables with chairs for 8. The barbecue is fired up for the Friday barbecue nights. 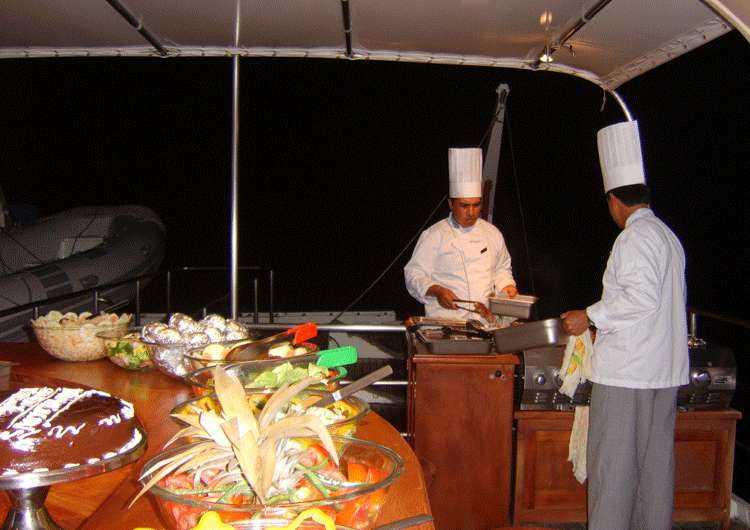 A typical barbeque includes Ecuadorian shrimp, meat, chicken, and sometimes lobster, vegetable dishes, and salads.